Make your home a visually appealing haven with the pristine ambiance of stonework. Courtyard Concepts has years of experience designing and installing luxurious stone outdoor living spaces and the elements that go into it. Our natural and veneer stone facing is certain to add grace, beauty, elegance and value to your home and landscape. With balance and durability in mind, we offer multiple stone options creating spectacular home designs that stand out amongst the rest. 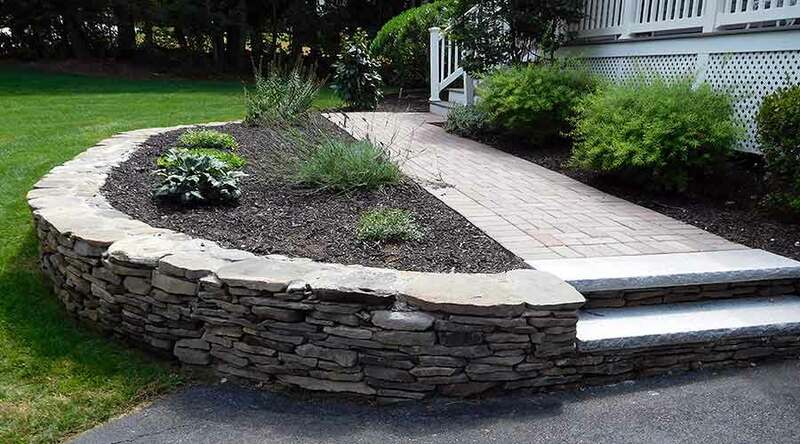 The sleek appearance of a stacked bluestone wall, a stately presence of a stone pillar, the rustic appeal of Pennsylvania fieldstone steps are just a few ideas sure to impress. Stone facing will add authentic exquisiteness and charm to any property or outdoor living space. Natural stone accentuates a timeless look to your landscape with modern design appeal. As it is made from real stone, its installation requires true skill. There are numerous advantages to natural stone. It is extremely durable, has a higher resistance to elements and debris, and is authentic looking. When designed with vision and architectural flair, natural stonework adds a sense of permanence and refinement to any property. Invite sturdy and effective functionality to your hardscape design while aesthetically expanding the style of your home into the outdoor environment. 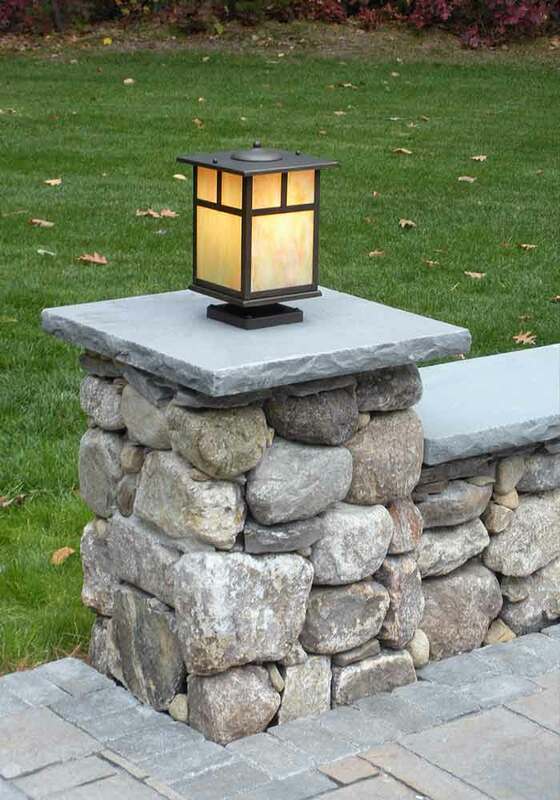 Add classic beauty to your home’s exterior or outdoor living space with veneer stone facing. Unlike natural stone, veneer stones are engineered to have roughly the same shape, size and texture for a simplified installation. With multiple types and colors to choose from, we can easily match your home’s existing landscape and get the exact look you desire. If budget is a concern, veneered stone might be a better option. It is man-made from cement cast in natural stone molds, with pigments and crushed natural stone incorporated during the process to give it a natural stone appearance. Light and durable, cultured stone can be attached to almost any surface outside of your home, from your home’s foundation to outdoor kitchens, seating walls and many other outdoor features. Courtyard Concepts designs and installs stonework to residential and commercial properties. We offer expert craftsmanship, quality products and detailed project management with a consistent focus on budget and design objectives. Our team is committed to providing outstanding customer service and is always excited for the opportunity to meet with homeowners. 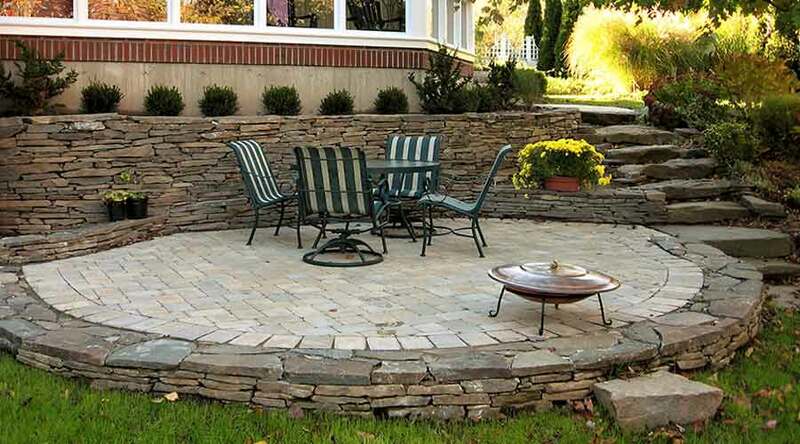 Contact Courtyard Concepts today @ 978-256-5454 for a complimentary stonework design and installation estimate. To view more images of our stonework, visit our stonework portfolio.